"Our only wish, to catch a fish, so juicy sweet!" As a huge Lord of the Rings/J.R.R. Tolkien/The Hobbit fan, I have to say, this is just plain awesome. I can't wait to visit New Zealand one day and see this in person! 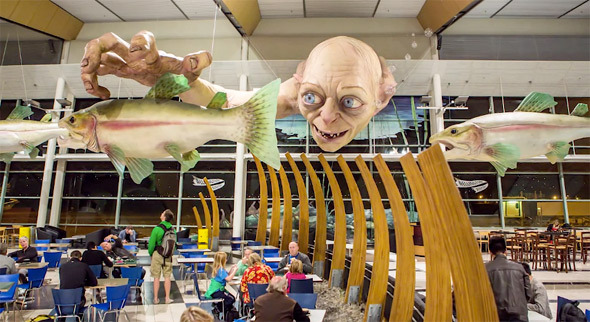 An art installation featuring a gigantic Gollum sticking his head underwater grabbing for fish was installed by Weta at the Wellington, New Zealand airport this week. We don't need to tell you that it's all tied in with a promotion for Peter Jackson's The Hobbit, with the first movie from the trilogy landing in theaters this December in just a few months. 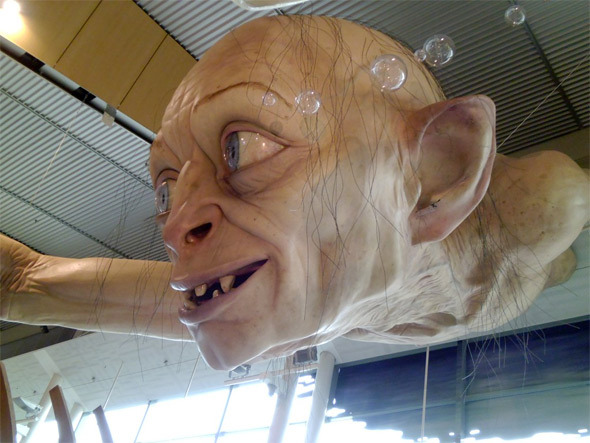 TheOneRing.net snapped a few photos of the huge Gollum art piece (and it's team of Weta designers) after it was installed, and there's video of the entire process, too. "So juicy sweet." The first photo via Screenslam shows the entire Gollum installation, with wooden bones(?) sticking up too. It even has bubbles coming from Gollum's mouth. "Everyone will be amazed when they enter the terminal." Here are all the creators posing for a photo. 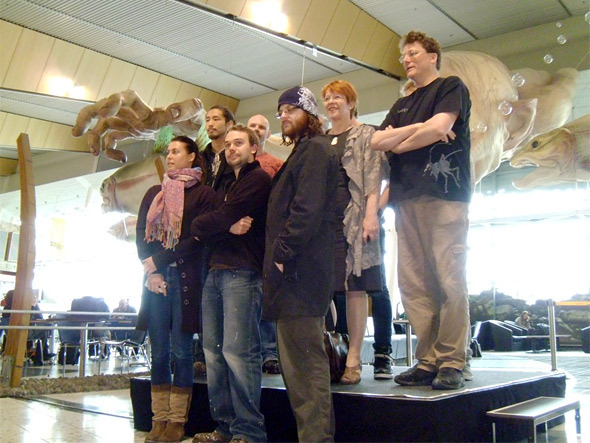 You can see Weta's Richard Taylor standing to the far right. Finally, here's a behind-the-scenes video of the piece being installed at the airport (found via Screenslam). 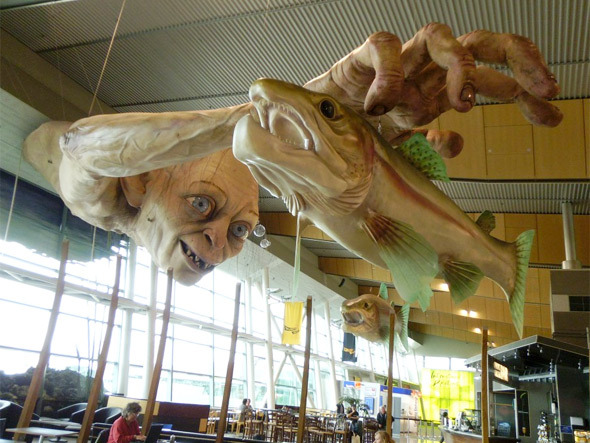 Such a cool installation and a perfect welcome for anyone flying into Wellington. More at TheOneRing.net. Seeing stuff like this makes me so mad to be sitting in a cubicle all day. I might have to take a short drive. I live 15 minutes from the airport. You talented buggers! I guess I should visit too.